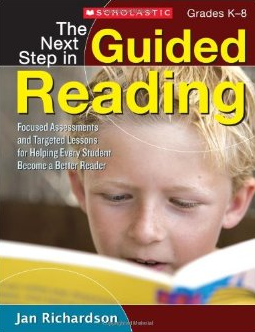 I just learned about guided writing this school year as I was investigating Jan Richardson's Guided Reading components. Currently, I am working with some second graders who are reading around a H-I level. The lesson plan for these kiddos is a two day plan, and guided writing falls into the second day of the lesson plan. Guided writing involves me dictating a sentence to students for writing practice. We spend two days on the same book, and then towards the end of the second day, I will give students a sentence I have composed for them to write. When I am composing these sentences, I make them about the book we've read, and I craft the sentence very strategically. For example, I try and use the sight words that have been taught recently. I also pick words that students can write, but might have to stretch to get to the correct spelling. I might also be curious about their knowledge of a phonics rule - so in this case, I would choose a word that followed that pattern to use as an assessment of their phonics knowledge. These are some of the things I take into consideration as I craft the sentences. 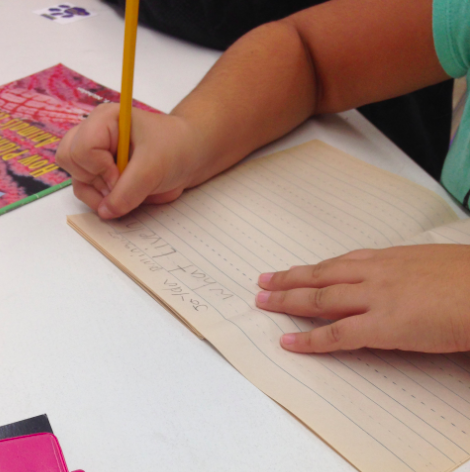 Guided Writing is also a great time to coach on correct letter formation. My kiddos write on primary lined paper that I have stapled into little books - so they can learn correct formation of letters. So, when they are writing the sentences, I am able to watch them form letters and then coach them to better writing. I might notice they are forming letters in the wrong way or that they are using capital letters inappropriately. 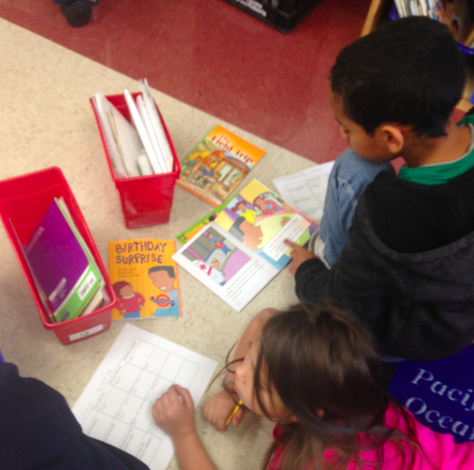 No matter what, it's a time to coach for improved writing! We also talk about what goes at the beginning and end of the sentences - so children are constantly being reminded of capital letters and ending punctuation. Have I sold you on Guided Writing yet? Well, if I have, then you'll want to make sure you do one more thing before you have kids write your sentence - rehearsal. The kiddos have to practice the sentence orally before they write or they will forget it. So, what I do is ask them to set their pencils down, and then listen to my sentence. The first time, I say it naturally. Kids listen. Then they say it with me a few times. Finally, I have them say it again, counting the words in the sentence. Then they are ready to write. I didn't expect this activity to carry over into other areas, but last Thursday I watched it do so. 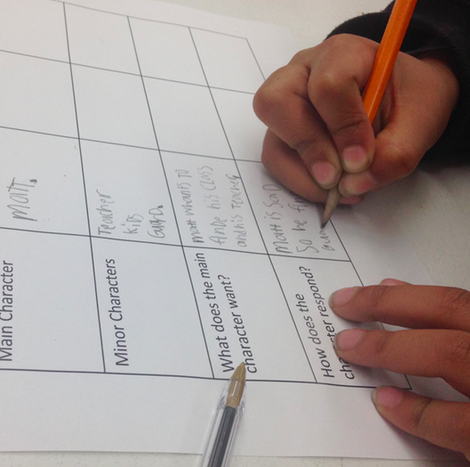 The kids were working on determining the major and minor characters, what the character wants, and how characters respond to events in their stories. I did the first cycle with them on our first book, and then they finished. What I noticed when they went to the rug to work together was that they were developing their sentences orally, "Annie wants..." and then they were able to write their sentences on their matrix. I didn't even tell them to write in complete sentences: they just did! It was awesome to hear them rehearsing for what they were going to write! Are you following my blog? If not, make sure to do so! 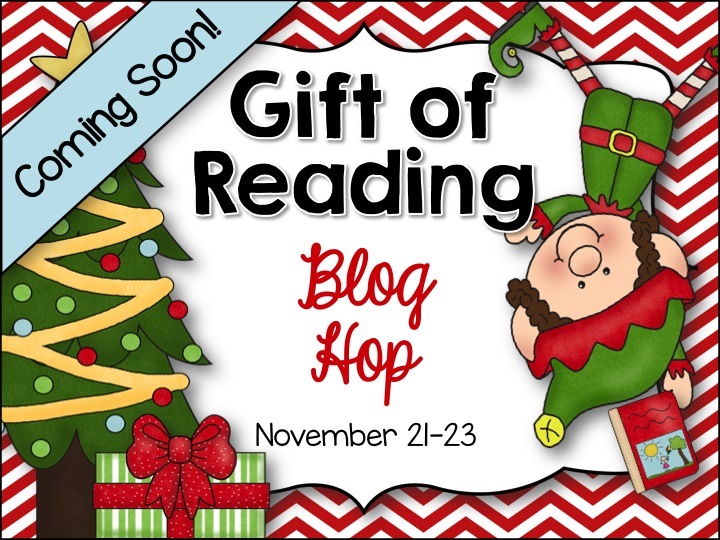 Coming next weekend, I'm participating in a great blog hop with some amazing Reading Specialists and Literacy Coaches. There will be lots of freebies and some giveaways, too! Happy Sunday! Hope your football team isn't annoying you as much as mine are! I love this blog! 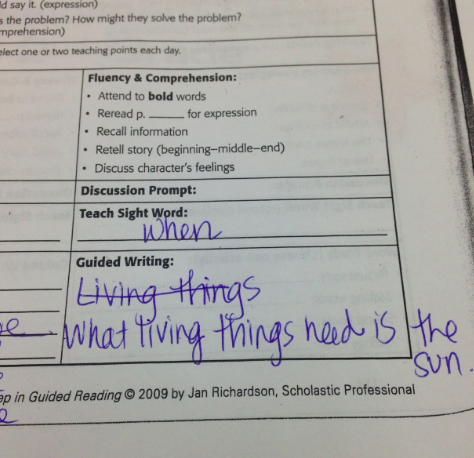 I agree with the guiding writing. Since I started teacher I no longer assume that students automatically know how to write. I think its best that we practice with them so that they will know , understand, and see exactly what it is that you are asking them to do. Some of our kids need the visuals to help them to comprehend what it is that they need to do.